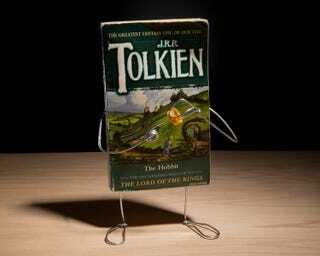 A few pieces of wire and a couple props turn these old paperbacks into whimsical sculptures, giving them the opportunity to play characters from their own stories. The Hobbit grabs the One Ring; 1984 is spying on us; and the works of Sigmund Freud are ready to analyze your dreams. Wiry Limbs, Paper Backs is the brainchild of Terry Border, who came up with the idea for this series when he spotted a rack of classic paperbacks at his local bookstore. He loved the personality of those old covers and decided to add a touch more by transforming the books into little book people. Head to his site to see what he does with Rosemary's Baby, The Maltese Falcon, and other works of paperback art.